After many years of a spinet piano, my wife was able to purchase a baby grand. The piano case is veneered in a vivid Mottled Mahogany but it came without out a bench. We used a standard bench for some time -until it gave way to age and the weight of the music stored under it's seat. So I was commissioned to build a replacement. 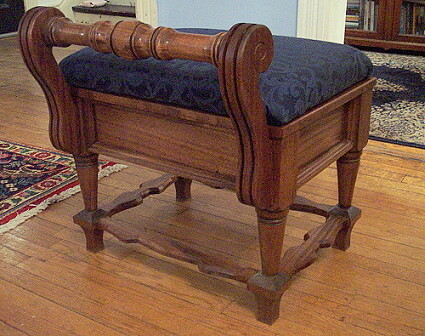 The result is this bench in Mahogany. This bench is massive in weight and is constructed with mortise and tenon joinery for a durability that should outlast the piano! The upholstered seat lifts off to reveal more than adequate storage for music.